Heat oven to 425°F. Cut squash in half lengthwise; scoop out and discard seeds and fibers. Place squash in ungreased 13x9-inch (3-quart) baking dish. Cover tightly with foil. Bake at 425°F. 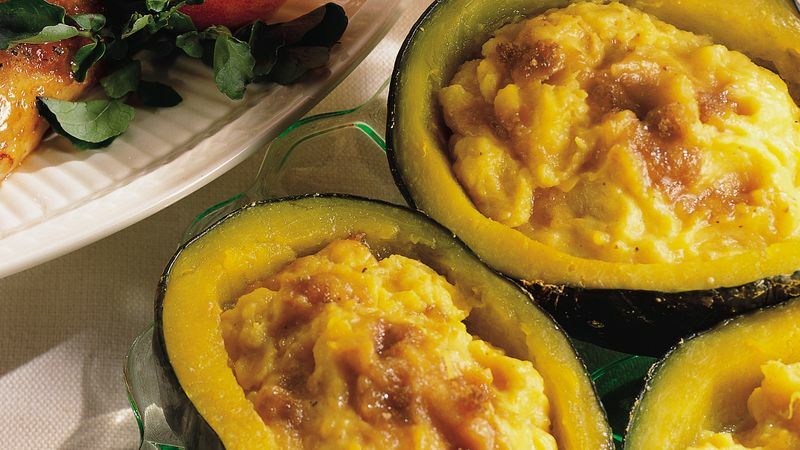 for 30 to 40 minutes or until squash is tender. Cool 10 minutes. Reduce oven temperature to 375°F. Scoop out squash, leaving 1/4-inch-thick shell. Place squash in medium bowl. Reserve shells. Add sour cream, salt and nutmeg; mix until smooth. Fill each squash shell with squash mixture. Sprinkle each with 1 tablespoon brown sugar. Place filled shells in same baking dish. Bake at 375°F. for 15 to 20 minutes or until thoroughly heated.